This is the quickest way to fix overlapping slide descriptions. If you have a lot to say, you can always provide a link to a new page that explains everything in full detail. This is a great option when you are using the In-Page Lightbox but you have a video slide. Video slides always open in the Pop-Up Lightbox when users click on the video. Hiding the description will only hide it in the Pop-Up Lightbox and it will have no effect on the In-Page Lightbox. 1. Click on the Flex Container and open the widget option panel. 2. Open ‘TITLE / DESCRIPTION’. 3. Go down to LIGHTBOX. 4. 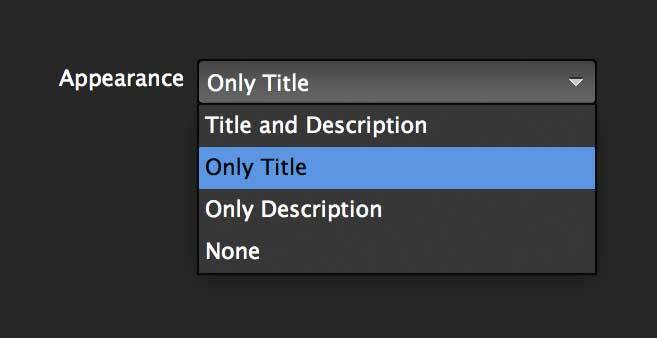 Open the ‘appearance’ dropdown and select ‘only title’ or ‘none’ to hide the description.